If you’ve ever been an administrator to a Facebook fan page, you may have had a brief encounter with web analytics. Facebook calls its social media analytics software “Insights.” The key metrics measured in Insights are tailored a little more to social networking and its viral potential, but the concept is the same. Visitors come to your site, they interact with it, and even though your site is live, that doesn’t mean it can’t change and evolve. Visitors can be turned into a focus group of sorts—if the proper tools are installed behind the scenes to capture that data. And you can utilize these analytics to make changes to ensure visitors do what you want them to do in the future. Websites cost money to build, host and maintain, but the good news is that web site analytics don’t have to cost you a thing! There are both free and premium analytics software suites readily available to install to your website. So you don’t have an excuse; if you have a website and it is devoid of any web analytics software, install something today! If you can’t do it, hire us. We can install to most sites for under $50. Analytics even help web designers redesign your site in the future. Designers can use data to see how many mobile visitors come to your site, and determine if you need a mobile version. They can help find broken links, see what search terms people use to find you in search engines, and they can even tell you the geographic regions where you are popular. You may be thinking, “My site isn’t anywhere near what I want it to be, I’ll invest in analytics when I get closer to a website presence that is more in line with my professional vision.” Well, throw that thought out with the rest of the garbage. 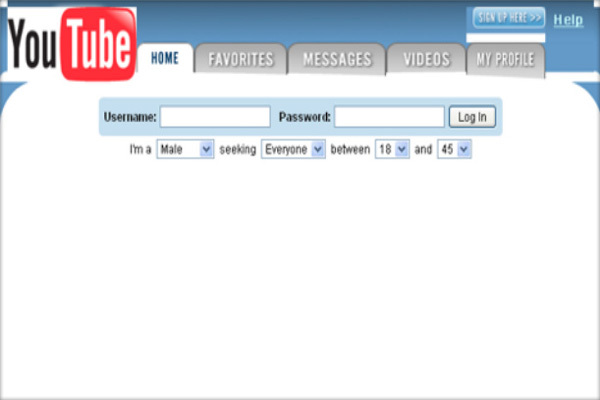 Consider that YouTube looked like this at launch. The best of websites still had humble origins, and yours is likely to be no different. If you need further proof, check out this Mashable article on other famous websites at launch. All this is to say that the perfect website will never truly be perfect—at least not for more than a few seconds. So don’t procrastinate, start measuring usage stats now. There are plenty of free analytic software solutions out there; let’s look at some of them. This is perhaps the most famous of all the free web analytics software solutions out there. Google offers this free because it integrates with their AdWords program. If you are going to be doing any hard cost advertising such as pay-per-click campaigns, you MUST measure results with some clear analytics captor in place. Installation consists of placing a snippet of code on any page you want measured. Most analytic stats are readily displayed through Google Analytics, but a few have to be linked up through another free tool Google offers called Webmaster Tools. Statcounter is a free analytics suite that is a little bit more limited than Google Analytics. The features in some ways are more robust out-of-the-box, but the limitation is that they only log so many stats for free. Still, expanding the program will only set you back $5/month, and you get 300,000 pageviews logged monthly for free to start. The results offered add a better level of granularity for really tracking what happened in a specific users visit, so check them out. We should probably mention that there is no limit to how many analytics software solutions you can use. By all means, install both—we have! The free web analytics are a no-brainer. Get them! Once your site has grown, you may find use of some other analytics that aren’t free. Mint is a little different. They let you host the analytics on your own server alongside your website. You host the dashboard to check them, not just the code snippet that captures visitor data. You have to purchase a site license to install it, and that costs you a $30 one time fee. You also have to install it yourself. It’s a solid analytics suite to implement, and they update the product regularly to keep up with the industry. Google Analytics has a lot of options, but understanding and tweaking them is quite difficult—even for us web designers and developers. KISSmetrics helps you to measure analytic data against your own conversion goals, and in a way that is easier for you. And their software also gets down to the nitty-gritty details, something important as your website grows. You’ll probably find that scalability is a big factor in analytic implementation as your website grows. Business-grade analytics or even small business analytics solutions abound, so jump on board. There are a lot of website analytics solutions out there. The bottom-line is if you have a website, you should have analytics installed. You may even have some installed on your host server, such as Urchin analytics, by default. Hopefully you do, and if not, get to it now! Even a company intranet can benefit from seeing how its employees use their site. If you have further questions, or would like a consultation, contact us today.